No one wants him, apparently. After just executing a blockbuster deal that landed Rudy Gay, perhaps it was too much to expect another one for the Raptors at Thursday’s trade deadline. 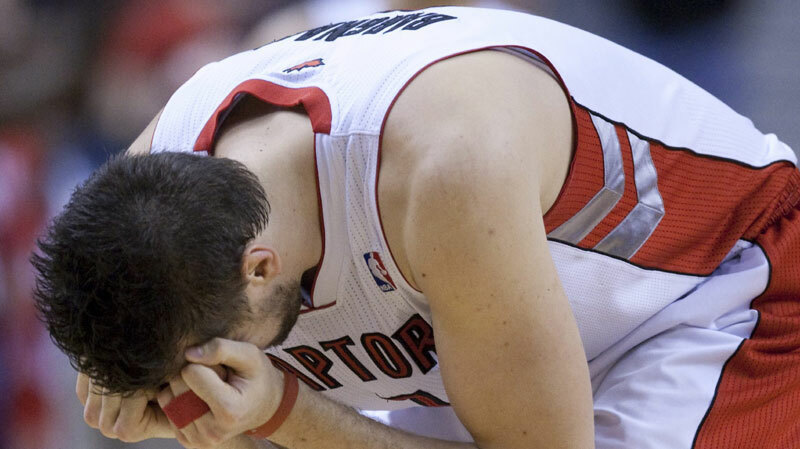 The Raptors failed to find a taker for perennial disappointment and franchise defining bust Andrea Bargnani. After selecting him 1st overall in the 2006 draft, the Raptors have been left waiting for Bargnani to develop some defensive or rebounding ability. With a multitude of injuries and declining play, it seemed as though the Raptors had finally given up on the Italian 7-footer. Raptors GM Brian Colangelo basically admitted as much after Rudy Gay trade, and Coach Dwane Casey removed Bargnani from the starting lineup. To make matters even worse, Bargnani was drafted before the new collective bargaining agreement was implemented, and thus his salary far exceeds his value. In light of this, other teams were unwilling to offer anything significant in a trade, and the deadline passed with Bargnani still wasting away on our roster. The Raptors were able to pull off a smaller deal, however, trading Hamed Haddadi and a second round pick for Suns’ point guard Sebastian Telfair. The Raptors got Haddadi as a part of the Rudy Gay trade with Memphis, but the only Iranian player in the NBA was actually denied a visa and therefore not even allowed into Canada. Telfair was a legendary New York City high school player, but he could never live up to the hype in the pros. He projects to compete for the Raptors’ backup point guard spot with John Lucas III. The Raptors are making a push for the playoffs, but it’s starting to look more and more desperate after having failed to make a significant move at the trade deadline.